Club de Campo Villa de Madrid has been a discovery for me. I love horses and this is another place that is not a racecourse where I can see them. 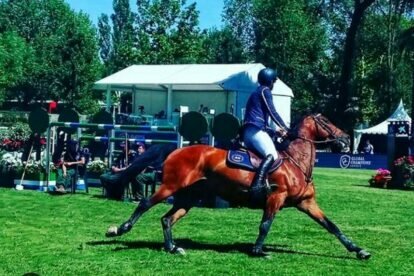 There’s dressing, jumping and a good atmosphere, and the Longines Cup and other international competitions takes place here. You can get here by bus if you do not have a car. In this club there are also first-level competitions of golf, tennis, horse riding, polo, hockey, squash, paddle … besides allowing different social and leisure activities, there’s also the excellent Olympic pool with the retractable roof that can be enjoyed throughout the year. The best thing is that you can have sports classes of your choice here, led by the best qualified personnel for it. They have programming throughout the year, but especially starting in spring, I recommend you check out their social networks to find out about all the events they have. But the club is not all about spots: it has several places to eat, like the cafeteria restaurant of the social pavilion, which is in the heart of the club and has privileged views. Cafetería del Picadero is especially suited for horse fans: it’s located in the covered Picadero Club, has an equestrian atmosphere and views over the track. Do not forget to follow their Instagram.